Five of us reach the fountain at the forks of the Ohio. This is a story about a group of friends who happen to go on cycling vacations together at least once each year, or at least, most years. These vacations have taken us to various parts of Ohio, Wisconsin, Quebec, New York, Minnesota, and other places long forgotten. This year’s adventure took us through Pennsylvania, Maryland, Virginia, West Virginia, and our nation’s capital, Washington, D.C. We rode our bikes on the C&O Towpath and the Great Allegeny Passage, plus a few more trails, from Georgetown, Maryland to the forks of the Ohio in Pittsburgh, Pennsylvania. Some say that memory is selective. We tend to forget things we dislike and remember the things we enjoy. Although we all had been on the C&O Towpath before, we remembered the history, the shade and the rustic nature of the towpath itself. We forgot that we remembered the spare keys to the truck and an essential pair of cycling shoes, so we got new spares for both of them. We forgot the bugs, the heat, the crowds at Harper’s Ferry on the day after Memorial Day, and yes, the mud. Mud that packs so tight into your front fender that even downhill becomes uphill. Mud that spatters your legs, your shoes, your socks, your water bottle and your derailleurs. Mud that makes a long day even longer. 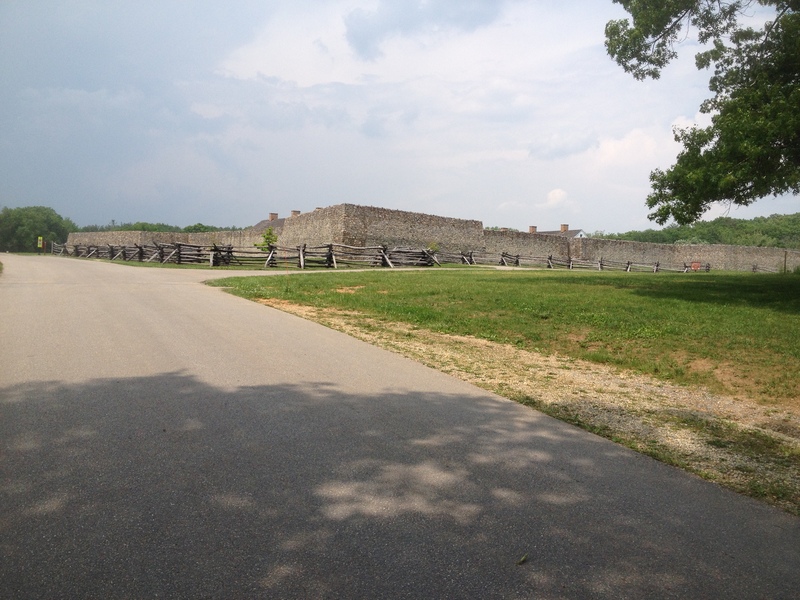 There is some neat stuff on the Towpath, including over 70 locks, the PawPaw tunnel, Bill’s Place in Little Orleans, a British fort (Fort Frederick), a few dams, White’s Ferry, and more than a few places of historical significance to Civil War buffs. 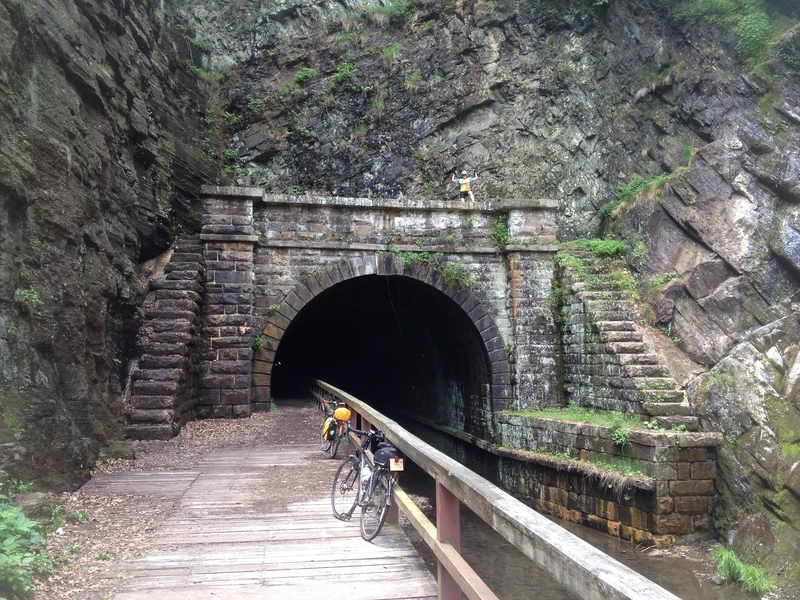 The Great Allegheny Passage is a much finer place to ride a bike than the C&O Towpath. Especially when you are going downhill. This was the case for much of our adventure as we traveled East to West (or South to North) as we followed the oxbows of the Potomac, the Casselman, the Youghiogheny, and the Monongahela. 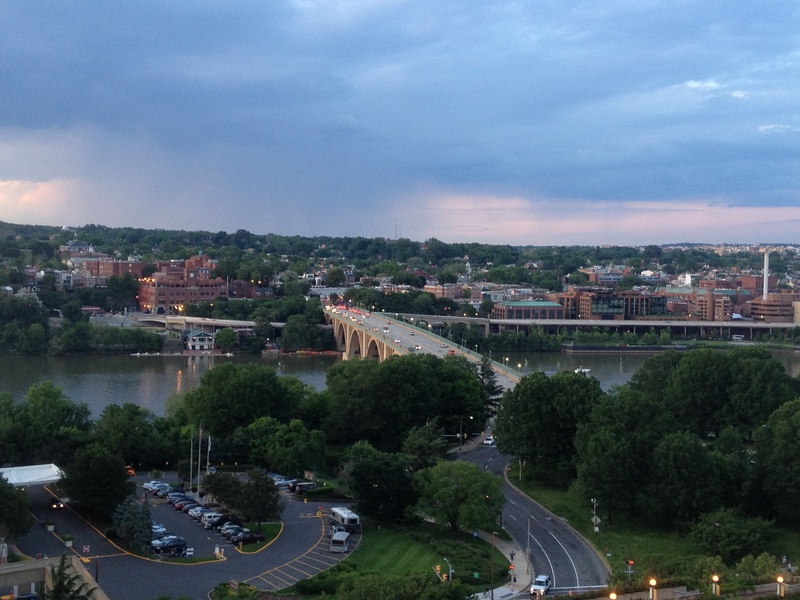 There were five of us who began our bicycling journey in Rosslyn. We originally planned to have a group of ten but we lost half of our crew to injury prior to the start of the ride. Nonetheless, two who could not join us for the ride itself gave two of us who did the ride a lift from our home to the starting point; these same good friends met us at the Point at the end of the ride to take our picture at the end of the ride. As a warm-up to our adventure, we toured the Rock Creek Trail north through the National Zoo in Washington, and followed Beach Road (closed on weekends to car traffic) to Bethesda. 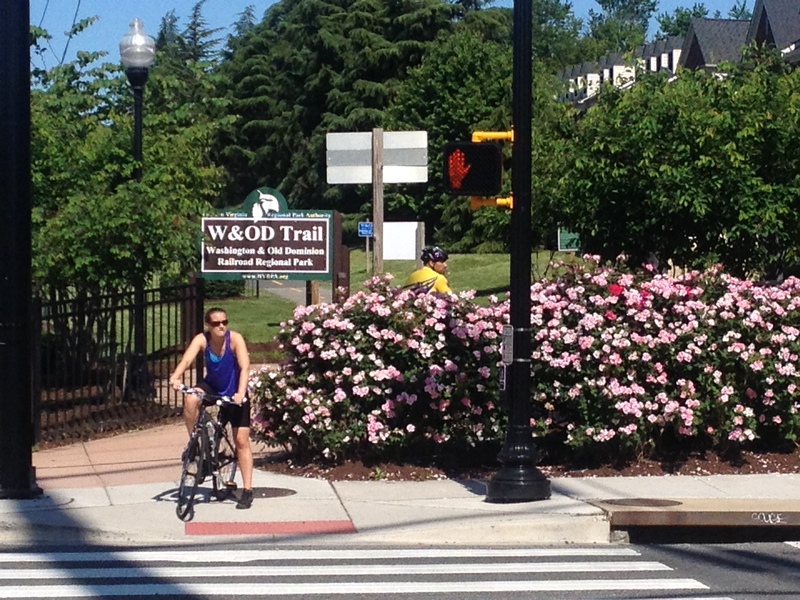 At Bethesda, we took the Capital Crescent Trail downhill for miles back to our starting point near the Key Bridge. Saturday’s dinner was at a forgettable sandwich place in Arlington (Ray’s) that was recommended by a friend and by Yelp. The adventure began in earnest on Sunday morning. 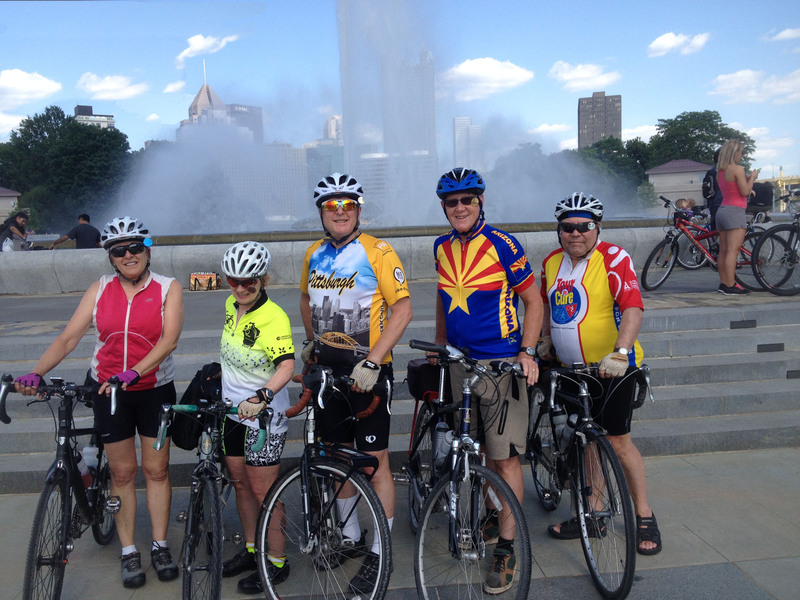 Four of the group crossed the Potomac into Maryland and rode the C&O Towpath to White’s Ferry. As it was Rolling Thunder weekend, they had to wait for over a hundred motorcycles to cross before they could cross with their pedal bicycles. 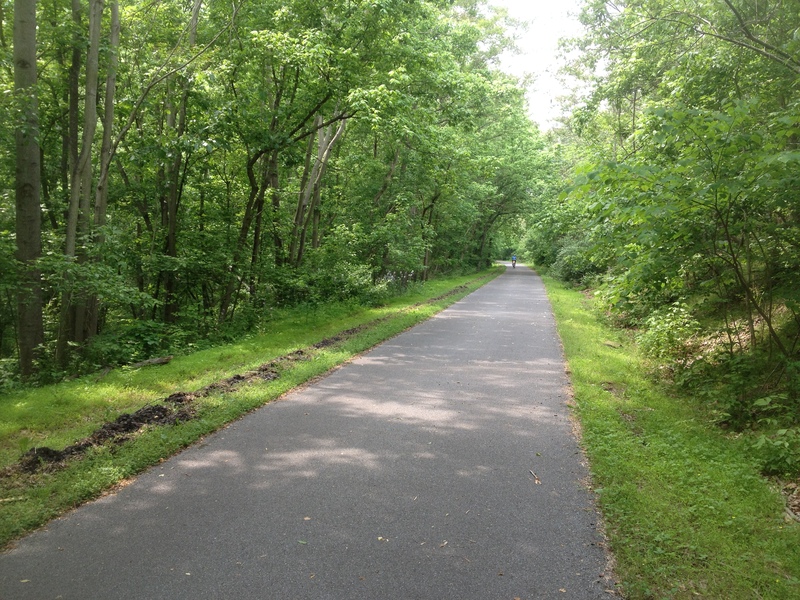 As I was the designated driver, I rode the Mount Vernon Trail south along the Potomac to Four Mile Run. 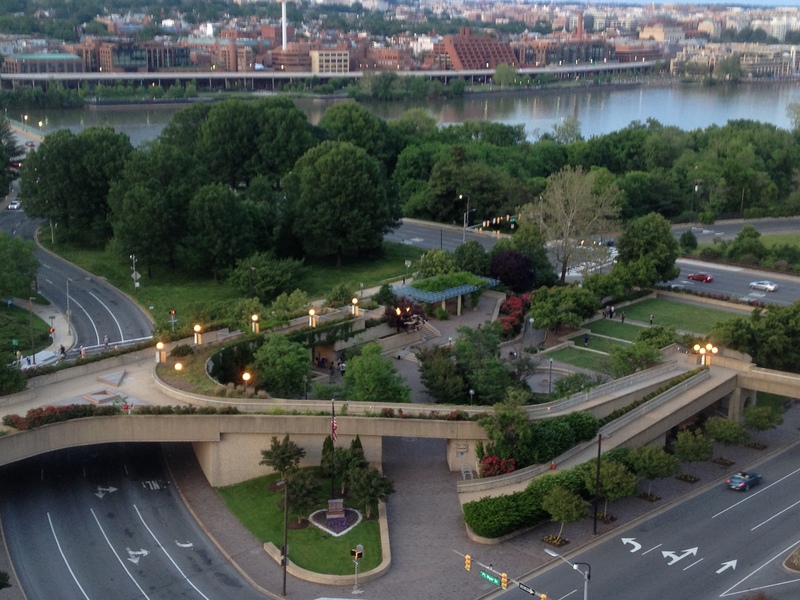 From there, I rode west along Four Mile Run to the Washington & Old Dominion Trail, and thence on the W&OD to the Custis Trail and then back along scenic I-66 to the Rosslyn Holiday Inn. 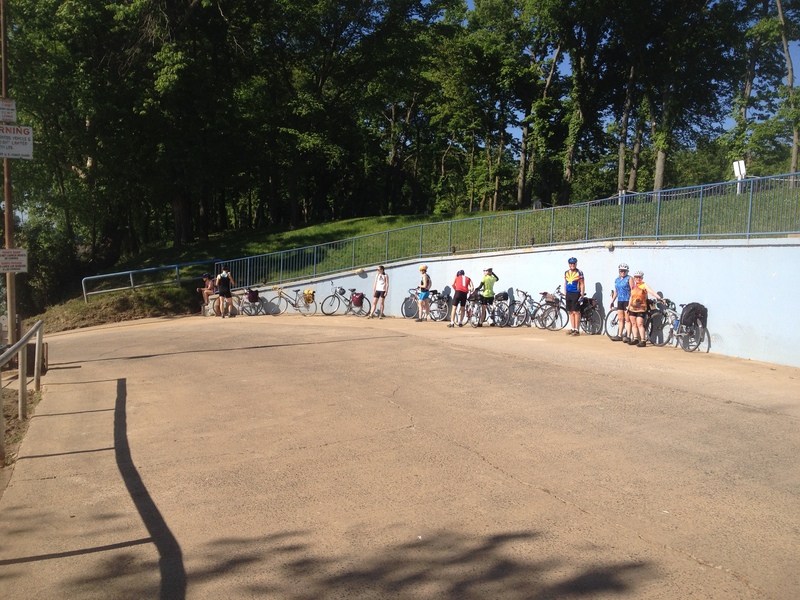 Riding the Custis Trail is a lot like riding a roller coaster. There are a lot of “ups” and “downs” on the Custis, with more “down” than “up” if you are heading towards Rosslyn. Purcellville, Virginia as seen from a terrific bike shop. The Best Western Leesburg was our destination for Sunday night. As it was only noon when I arrived, I took the opportunity to ride the W&OD from Leesburg to Purcellville and back through beautiful horse country. 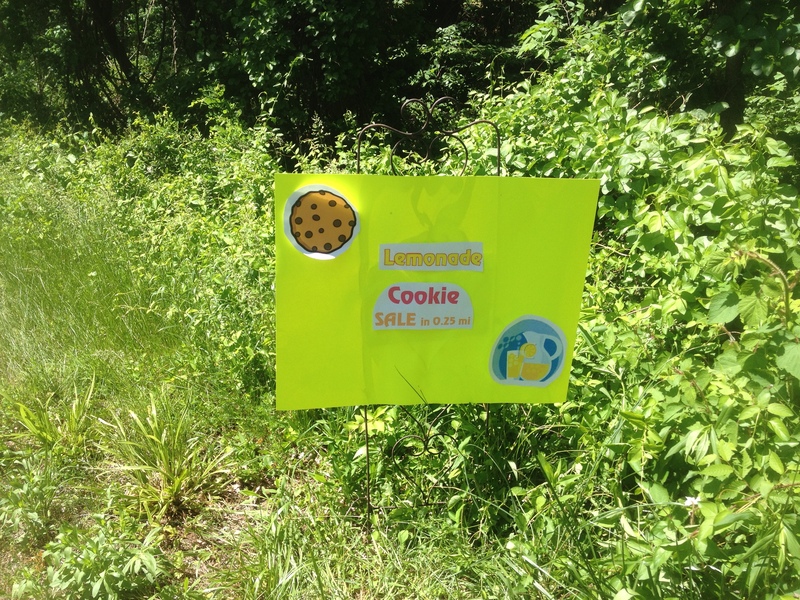 Along the way, I stopped for lemonade and cookies offered by a young lady and her father, who were planning to go to RAGBRAI this year. 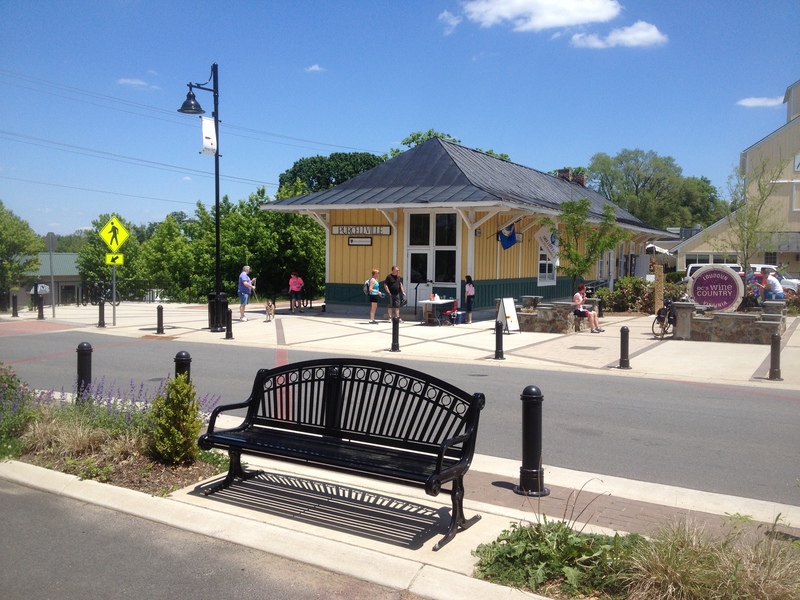 At the end of the trail is Purcellville, a picturesque village with an outdoor restaurant with live music and a well-appointed bicycle shop. 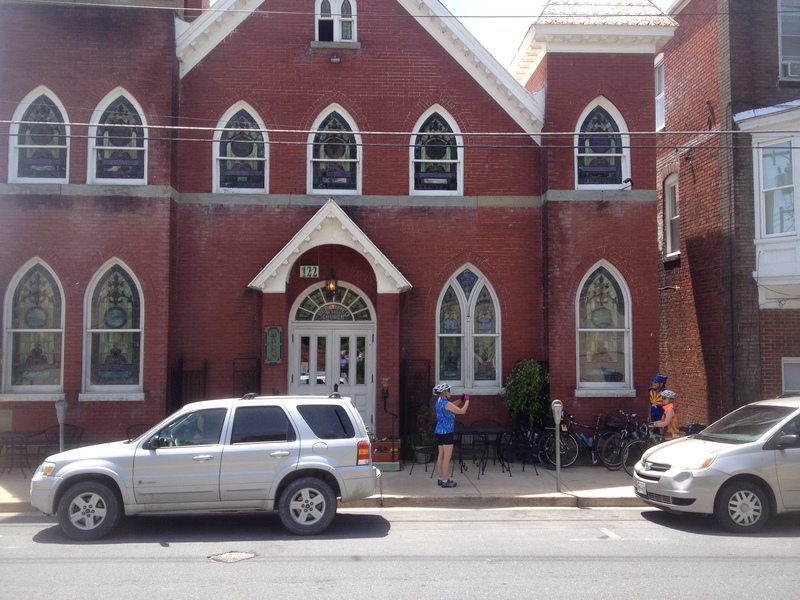 I took my bike into the bike shop for a minor repair and was quickly on my way back down the hill to Leesburg. Morning traffic waiting to cross White’s Ferry. Beans in the Belfry. A Reformed Church. That evening, my wife and I had dinner with two great friends who now live in the area. You know you are with good friends when you both, independently, make reservations for the same restaurant (Tuscarora Inn) at the same time (6:15 pm). The food was great, the service was impeccable, and the conversation lively. We will be seeing them again soon, I hope! Monday, we followed the W&OD a few blocks to the historic part of Leesburg, and then took VA 15 to the road to White’s Ferry. We lined up with a number of other cycling tourists and rode the ferry across the Potomac to the C&O Towpath uneventfully. 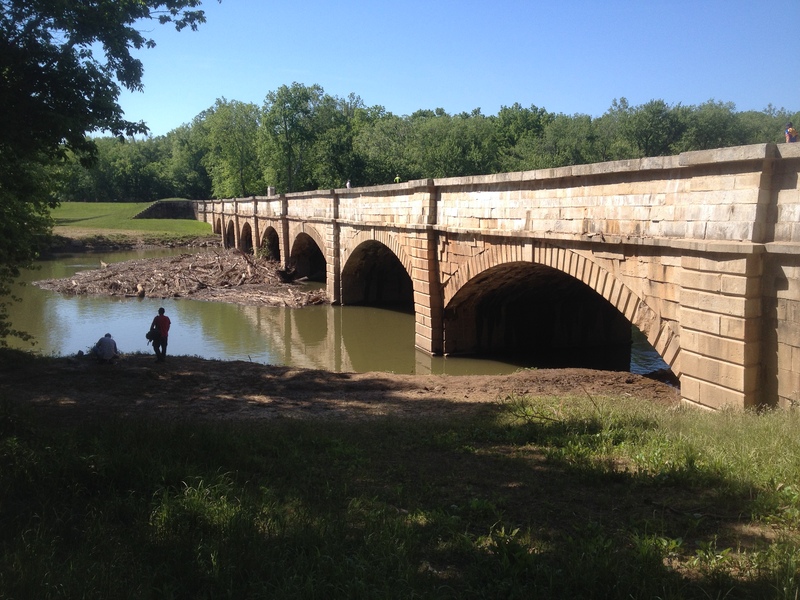 We crossed the impressive Monocacy Aqueduct and took a few pictures. 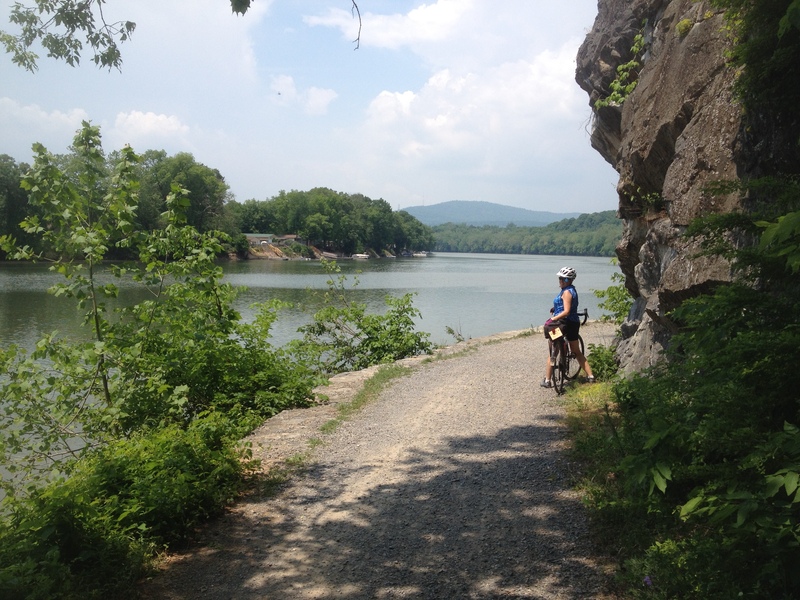 We also stopped at Dam 4 and followed the newly opened concrete pathway along Big Slackwater. Nice, but we also encountered long stretches of four-inch-deep mud. I guess that the Potomac had flooded recently. We stopped at Beans in the Belfry in Brunswick for coffee. Beans in the Belfry used to be a church, now it’s a coffeeshop with delicious baked goods. It was recommended by cyclists from Iowa whom we met on the trail next to a fallen tree that completely blocked our path. We looked for the Brunswick Visitors’ Center but could not find it, so we rode on to Harpers Ferry. We carried our bikes up the stairs and walked them across the bridge across the Potomac, seeking sustenance amongst the hordes of Appalachian Trail hikers, bicyclists, climbers, and tourons. We found the Holy Grail of lunch spots most of the way up a hill, the Town’s Inn. Behind this B&B is a patio seating area best described as a “grotto,” with a stone wall, stone floor and ample shade. The food was delicious (I had a pulled pork sandwich) and the service was good. Best of all, it got us out of the bright sun and the crowds. We continued on to Shepherdstown, West Virginia, home of Shepherdstown University, the Bavarian Inn, a Clarion Inn, and a Comfort Inn. We stayed at the Comfort Inn, a newer hotel at the far end of town. Thoughtfully, the powers that be constructed a bikeway along WV 45 out to the hotel. The hotel is adjacent to a Food Lion, a laundromat, and several dining establishments. As we needed more exercise, we skipped the nearby pizza joints and Chinese restaurant and decided to walk into Shepherdstown for dinner at the Blue Moon Cafe. We guessed it was formerly a speakeasy as a stream ran through the outdoor seating area where we ate more good food. There was so much of it we could not finish it all! Paw Paw Tunnel, east entrance. 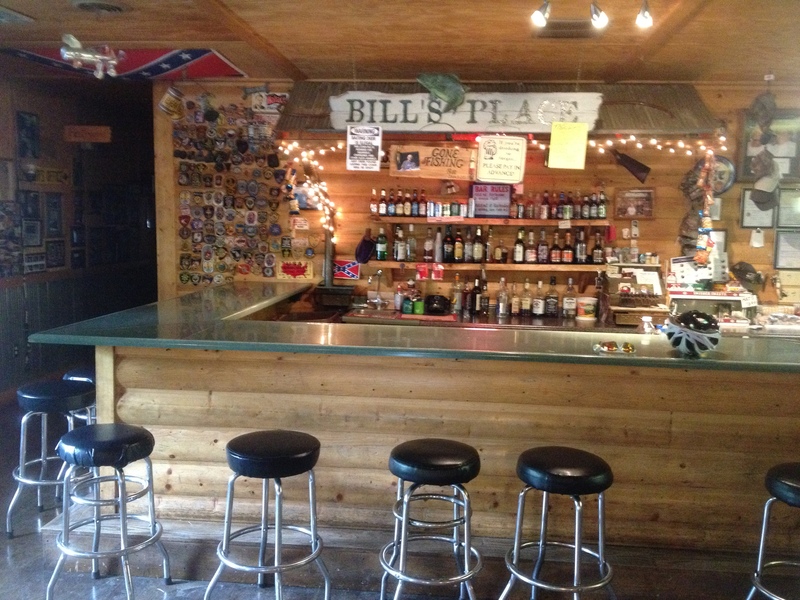 Tuesday’s destination was the 1828 Trail Inn in Hancock, Maryland. Bill and Darlene Smith, the innkeepers, were wonderful hosts. The Trail Inn boasts a huge front porch overlooking the two bike paths that run through Hancock – the C&O Towpath, and slightly nearer, the Western Maryland Rail Trail. We took the WMRT in from Fort Frederick and rode it out to the other end as we left Hancock. The juxtaposition of the two trails shows how different they are in character. The C&O Towpath is a muddy dirt road. The WMRT is a newly paved asphalt ribbon, eight feet wide. If I were a roller skier or roller blader, there’s no doubt in my mind which one I would choose! Lunch was at Williamsport. The Desert Rose Cafe is a good choice for lunch. Two of us went to the Desert Rose. Two went across the intersection. Enough said. Dinner was at Weavers’ Restaurant in Hancock. The service was fantastic and the pie ala mode was delicious. We asked for a bag of ice for a tired knee. They gave us enough ice for our cooler! Wednesday was one of our longest days, Hancock to Cumberland on the Towpath. We saw lots of wildlife, toured Bill’s Place in Little Orleans, and walked our bikes most of the way through the Paw Paw Tunnels. 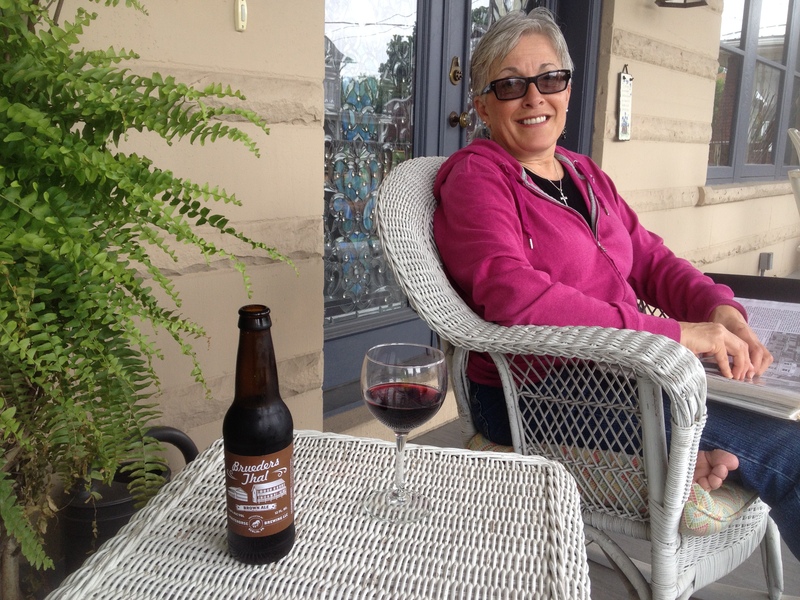 We had a number of flat tires along the way, leading a couple in the group to look for Flat Tire Ale in Cumberland. We stayed in the Fairfield Inn in Cumberland, a grand new hotel right on the end of the Towpath. They knew we were coming as they had a large patio with bike racks and a hose to rinse off the bits of Towpath that clung to our bikes. The Fairfield Inn has a nice pool, whirlpool, breakfast and great service. They carried our gear in to the hotel rooms where we were staying; suggested a great place for dinner (Ristorante Ottaviani); and gave us shower caps for our bike seats as we were checking out. On Thursday it rained. 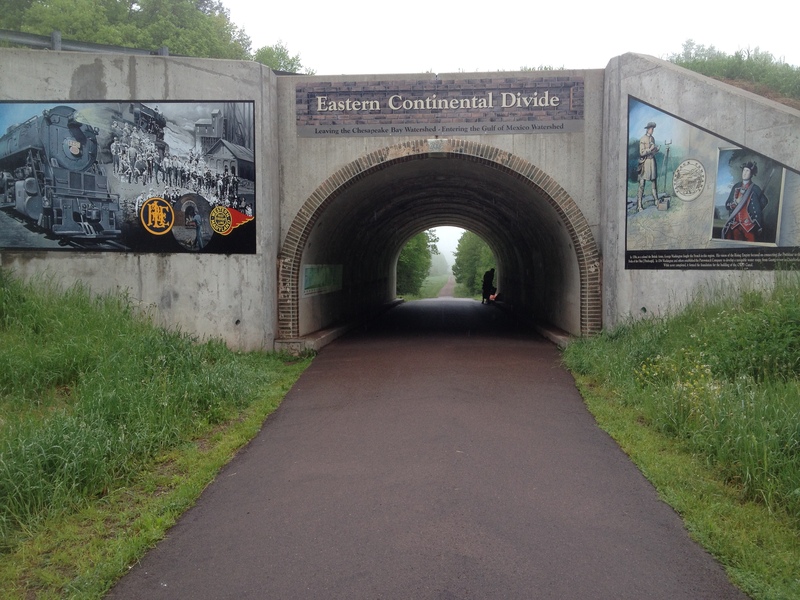 It started as a drizzle and continued from Frostburg to the Eastern Continental Divide. Some of us stayed at the Morguen Toole Company. The Morguen Toole Company is a three-story building with a restaurant on the first floor, a pub on the second, and loft-style sleeping accomodations on the third. Dinner was good and breakfast was nearby. A sixth member joined our party Thursday evening. 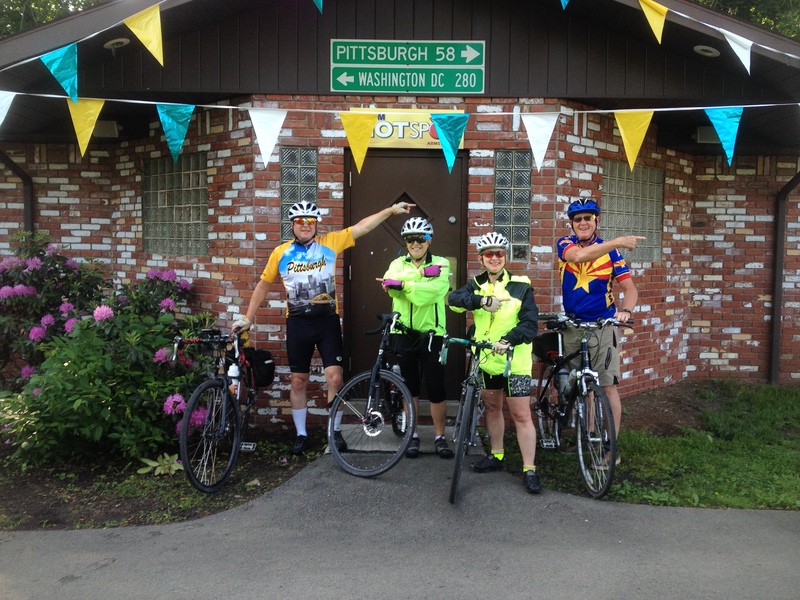 He rode from Homestead, PA to Meyersdale, PA, a distance of 115 miles, to join us. The rest of our party stayed at the Levi Deal Mansion. It was very different from Morguen Toole. 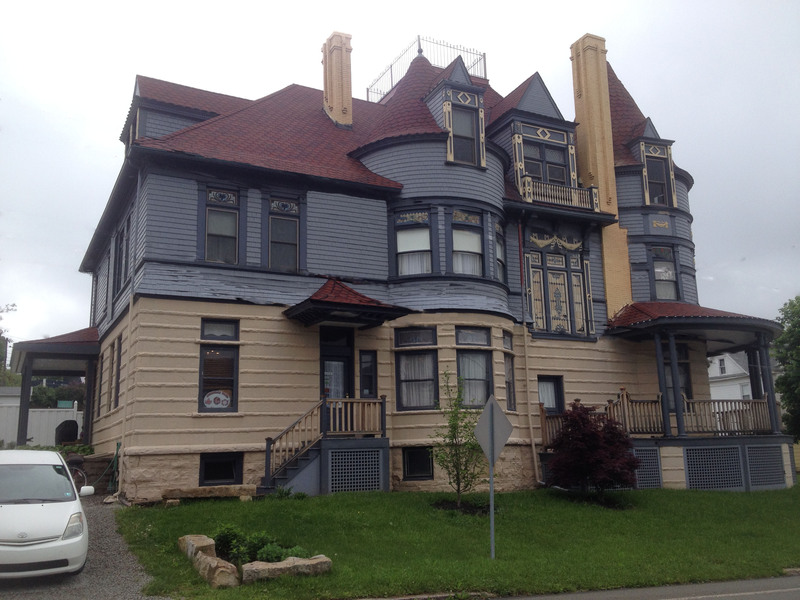 The Levi Deal Mansion is a restored coal baron Victorian, furnished exquisitely with antiques, a large parlor and front porch, and hosted by Jan and Michael. Our stay came with complimentary beverages and snacks upon arrival and a delicious omlette with fresh all-you-can-eat blueberry pancakes with local maple syrup for breakfast. The Jacuzzi tub was a plus! From Meyersdale, the rest of the ride was all downhill. Literally. We stopped at Sisters’ Cafe in Confluence for lunch, a favorite place of ours for years. At Ohiopyle, we stopped for ice cream, and then rode down the trail to a newly found “Northwest Passage” to the Melody Motor Lodge, our accomodations for Friday night. Our “Northwest Passage” was Riverside Drive, a shortcut from MP 86 on the Great Allegheny Passage to US 119, approxiately 100 yards north of the Melody Motor Lodge. The Melody Motor Lodge meets the three “C’s” of frequent travelers – clean, comfortable, and cheap. Dinner was a phone call to Domino’s Pizza and breakfast was at the Valley Dairy in Connellsville. While the Valley Dairy has dependably excellent food and service, I think the next time I’m in the area I’ll try Ed’s Diner behind the Melody. Leaving Connellsville, we were on the home stretch to Pittsburgh. We stopped in West Newton at the trail visitor’s center and in Boston at Generoso’s for lunch. On familiar ground, and pavement, we nearly flew to the Point to meet our friends and complete our ride. Point made! This is a great place to ride a bike in nice weather. Here are some photos from a trip I took on it in September 2008. Thank you for sending me a copy of the “2013 Official U.S. Government Survey,” an official federal document. I believe the intent of this document is to ascertain my views on key critical issues facing our country. I do not believe my responses to the survey would accurately reflect my views on these issues so I am writing you this letter to let you know exactly where I stand. I think you will agree with me that our country faces serious issues that need to be dealt with by all branches of government – legislative, executive and judicial. Furthermore, I think you will agree that some of the bigger ones are national security, the national debt, health care, and energy. These issues need to be addressed in a cohesive, comprehensive, strategic manner to be effectively dealt with, as they are all interrelated. Our nation’s dependence on imported energy has led us to squander several trillions of dollars while annoying 800 million residents of the countries where this energy comes from to the point where they threaten our national security with planned acts of violence. Becoming more self-sufficient in fueling our homes, automobiles and businesses will address both of these issues. There are two key methods for becoming more self-sufficient in energy. These are increasing domestic production and reducing domestic demand. I believe that both approaches should be strongly supported by a rational government. Economists tell us that our national debt is a future claim on our gross domestic product. Today, we owe the Chinese over a trillion dollars. A trillion is a million million. This is not a small sum. I think you would agree that we shouldn’t have to sell our national treasures to pay for money squandered by an irrational government, or leave this debt as a legacy for our children and their children. Health care costs are out of control in our country. I’ve heard that Medicare alone is a $70 trillion unfunded mandate. According to the American Diabetes Association, in 2011 25.8 million children and adults in the United States had diabetes. This is 8.3% of the population. Common complications of diabetes are heart disease, stroke, high blood pressure, blindness, kidney disease, nervous system disease, and amputation. The annual costs of diabetes in the United States were, as of 2013, $245 billion for treatment, including $176 billion for direct medical costs and $69 billion for reduced productivity. These figures do not include the non-monetary impact of managing a relentless, incurable disease for the 25.8 million who suffer from it. Almost all (25 million) of those who have diabetes in the United States have Type 2 diabetes, widely believed to be a direct consequence of obesity and a sedentary lifestyle. If we are to control health care costs, we need to reduce their causes, which are principally behaviorally related. As a society, we don’t get enough exercise in our daily lives to stay healthy, we smoke too much , drink too much, don’t wear our seat belts and motor cycle helmets enough, and eat too much of the wrong foods. I’m not in favor of telling people what they should do, but if they choose to make poor choices, they should suffer the economic consequences of those choices. That’s only fair to the rest of us. Investing money in our communities to encourage behavioral changes that reduce future health care costs makes excellent economic sense. Even the most selfish among us should see the value in encouraging forms of transportation that reduce our consumption of imported energy and decrease future health care costs. There are approximately 315 million people in the U.S. The direct per capita cost of diabetes is $245 billion / 315 million = $777 per person, per year. The U.S. spends $8233 per year on health care per person, according to an article published by PBS on 22 October 2012. What would be the net cost of safe bike routes in our communities for us to take to work and our children to take to school if they led to a sustained and substantial decrease in health care expenses? According to an article on the AARP blog posted 16 April 2013, the average yearly cost to own a car in this country is $9122. Major components include depreciation, maintenance, taxes, insurance, gasoline, oil, tires, parts and fluids. While some of this cost is distributed locally, the largest parts of it go outside the local community. This figure does not include the 40,000 killed and 3,000,000 injured in the six million car accidents that take place each year in the United States. The majority of car accident victims are the drivers, then the passengers of the cars, followed by pedestrians, and lastly cyclists. The leading cause of death in the United States for people aged one to 30 years, is car accidents. Persons aged 15 to 24 and greater than 75 are most severely affected by car accidents. How many $trillions are we spending to support military operations to continue a car-dependent lifestyle? How many $trillions are we spending to treat the symptoms of obesity, rather than the causes? Why are we spending so much on taxpayer-financed sports arenas and highways, and a pittance on things that will improve the quality of life for millions of Americans? Why are car dealerships the largest contributors to local and congressional elections? How does this affect community and regional planning decisions? Could this be a factor in the reluctance of other locales to follow Portland’s lead? Why are John Mica and Bud Shuster making decisions on transportation at a national level? Isn’t it really a health care/national security/economic issue, not a transportation issue? In 1958, Dr. Charles (David) Keeling began taking daily measurements of atmospheric carbon dioxide (CO2) atop Mauna Loa in Hawaii. With his first measurement, taken in March 1958, he recorded an atmospheric CO2 concentration of 313 parts per million (ppm). Dr. Keeling observed that the CO2 concentration followed a seasonal pattern. He postulated that atmospheric CO2 decreased during the northern hemisphere summer due to plant growth and increased each winter. Furthermore, he noted that the average CO2 concentration in the atmosphere increased each year. He ascribed this to fossil fuel combustion and land use patterns. In February 2014, the atmospheric CO2 concentration at Mauna Loa has risen to 398 ppm, an increase of 27 percent over 56 years. Is this significant? Consider that CO2 levels were around 200 ppm during recent ice ages, and around 280 ppm during warmer interglacial periods. In my mind, this is incontestable evidence that the recent increase in atmospheric CO2 is caused by human activity. A number of scientific organizations of national and international standing concur, including the American Meteorological Society, the American Chemical Society, the National Aeronautics and Space Administration, and the National Oceanic and Atmospheric Administration. 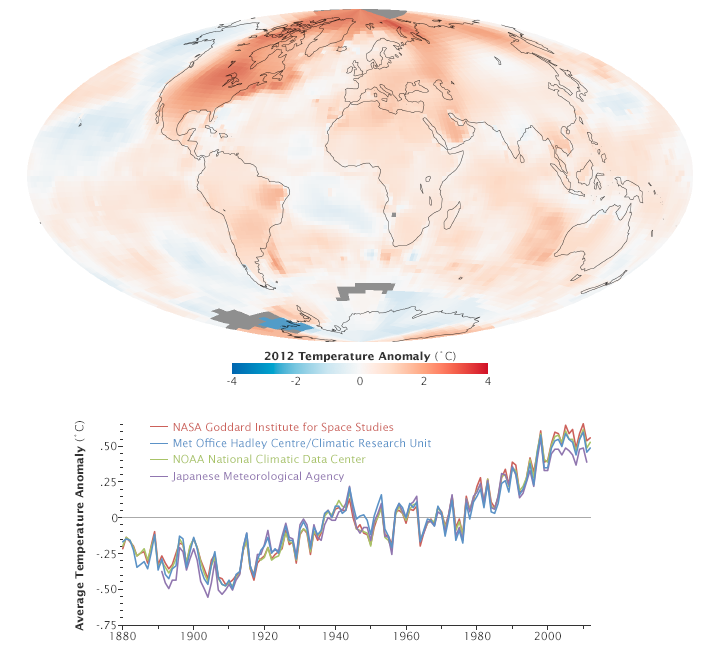 Please see the Wikipedia article, Scientific Opinion on Climate Change for a more comprehensive list. Why do we care about atmospheric CO2? After all, CO2 is essential for plant life. More of it may well be a good thing, right? What does this data tell us? 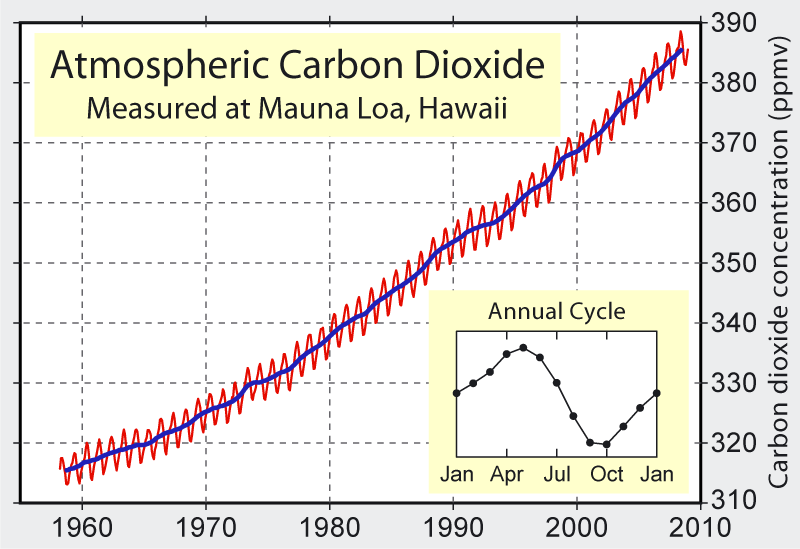 I look at this graph and I see a correlation between atmospheric CO2 and temperature. Higher CO2 implies a higher temperature, at least at the poles. This concurs with the significant reduction in Arctic sea ice over the past dozen years or so. Why do we care if it gets warmer? It’s been a pretty cold winter in the northeast United States this year. Wait a minute… could the persistent drought in the southwestern U.S. be part of a pattern of climate change? Could the lack of snow in the Sierra Nevada mountain range be a cause for concern for agriculture in California’s Central Valley? Could this be somehow related to the fact that the ten warmest years on record have all occurred since 1998? I’m not a scientist. 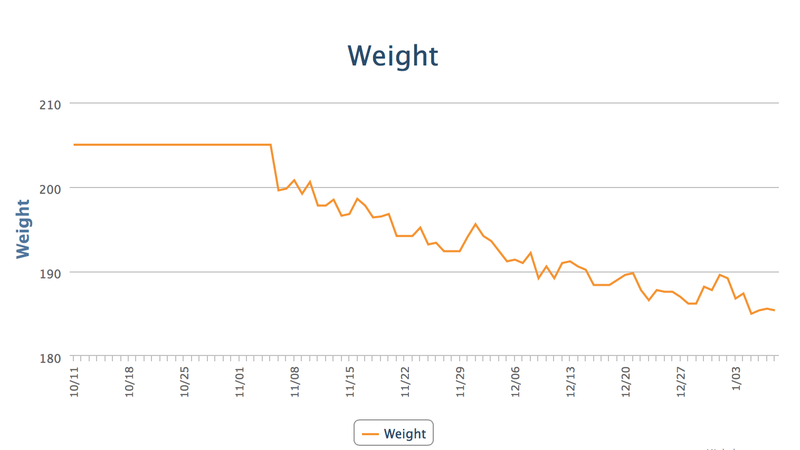 But the data is pretty convincing to me. The world is getting warmer, quickly, with unpleasant consequences in the wings. And we humans largely to blame for it. Admittedly, climate science is inexact, has many variables, and we have a lot yet to learn about it. So does western medicine. Yet, we don’t insist that journalists give equal time to the witch doctors of Papau New Guinea to dispute the rationale of western medical techniques. So why do Fox News and the Republican Party give a voice to those who would debate what is obvious to 97% of those who specialize in climate science? Is it for the money? Or do they just prefer to take a free market approach, and let Nature take its course, whatever the outcome? Perhaps the answer lies in who’s behind some of the doubting scientists. Some of them used to doubt the existence of a causative link between tobacco use and lung cancer when their funding came from the Tobacco Institute. Today, they get their funding from somewhere else… the Koch brothers, perhaps? Next time I go to the beach, I’m renting. My first professional employer post-college decided that they did not need me anymore after almost 28 years with them. They really did not come out and say this to my face but their actions spoke very loudly once I was out the door hitting the pavement. Despite the existence of Federal statutes that prohibit age-based discrimination in employment, many companies apparently take into consideration the much higher net present value of post-retirement benefits, the higher salaries, the greater vacation allocations, and expected health care expenses of long-term employees in comparison to younger hires when terminating the older worker with severance and then closing the door behind them as they leave. My story is not uncommon. What I learned is this: When you are over 40, and looking for work, answering postings on the Internet and waiting for the phone to ring is a waste of your time. For every job posted online, there are (on average) 400 applications entered. Of these 400, approximately 20 are considered for phone screen interviews. Of those 20, perhaps three are invited to interview, onsite, at the prospective employee’s expense. One of the lucky three may get hired. Older employees are usually dropped at the initial screening process because there’s a perception that they lack the essential technology skills or energy that younger prospects are expected to have. My advice to the older job seeker: Don’t waste your time looking for that next job online. Make some sales calls, instead. Create and use a network. You’re selling a product; pick up that 500# telephone and make some sales calls. Tell everyone that you call that you don’t expect them to have a job for you, but that you would like their help in finding one that fits your skills, knowledge and abilities. Let them ask what those are, and let them decide if they want to buy or recommend you to someone else to talk to. Successful life insurance salespeople are great at this, and also great contacts to use in the job search process. You are not alone. It happens to many of us. If possible, join up with Seekers, or Priority Two for coaching and motivation. These are good places to establish connections with other job seekers who can work with you to hold yourself accountable in the search. Job hunting is a full-time job that can’t be done from behind a computer screen. You must make the calls. Eighty percent of jobs found by the 50+ job seekers are found through networking. The rest might be through headhunters. Half of those jobs are created at the time the job seeker contacts the potential employer. Above all, don’t wait for your unemployment benefits to run out before you start your networking job search campaign. Let’s say you want to borrow $100 from me, and I have $100 to lend. In exchange for my giving you the $100 today, you promise to return the $100 to me exactly one year from now, plus another $10 for the privilege of using the $100 for the year. We call that extra $10 interest. Interest is the fee that you pay as “rent” for the use of borrowed money. The cost of borrowing money varies in proportion to the risk that the lender takes on by lending it; that is, the risk that the borrower fails to keep his commitment to return it when it is due with the agreed upon interest payment. If the lender faces a higher risk of default, he will charge a higher rate of interest, or not lend the money at all. In general terms, then, expected returns normally increase with risk. Small companies grow faster than large companies, and companies with large book values relative to their earnings are less “risky” than “growth” companies. The performance of companies based on foreign soil is less correlated with the performance of domestic companies in the same markets; the performance of companies based in developing countries is only loosely correlated with the performance of companies in developed countries. An efficient allocation of investments will have a mix of assets representing assets from each of these asset classes. Many financial advisors (“wealth managers”) will invest your retirement assets in an “efficient” portfolio for a fee, usually in the range of 1.0 to 1.5% of your assets on an annual basis. Some of them will place your assets in funds with a “sales load,” a commission that comes right off the top, in addition to their fee. An example of these funds is the “American Fund,” which charges a 6.5% sales load. Others place your assets in “managed” funds, where they make the assertion that they can “beat the market” through the application of superior financial acumen. On the average, their performance is, well, average, before they take out their fees. I prefer to invest my investment assets in index funds with minimal fees, offered by Vanguard and Charles Schwab & Co. The index funds, by definition, have the same average performance as the actively managed funds, only without their expenses.